Joshua and Georgina seen together with Karena Waller (centre). Microbiology researchers from around Victoria gathered recently for the annual Australian Society for Microbiology’s BD Student Awards Night. As part of the evening’s proceedings, six postgraduate students from Universities and Institutes around Victoria presented their research findings while competing for the BD Award, which is proudly sponsored by Becton Dickinson (BD) Biosciences. 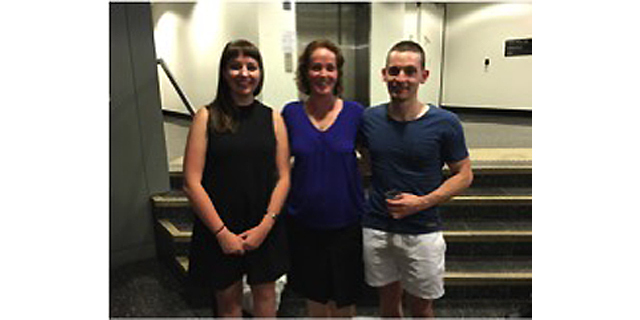 Joshua Newson was awarded the BD Award for best presentation and Georgina Pollock was awarded the Victorian ASM Branch Award as first runner-up. The evening was chaired by Karena Waller, Chair of the Victorian ASM Branch.